Much has been written about the rise of online streaming services and the furious pace at which original content is being generated. This year, Netflix is taking the lead with their $8bn content investment, followed by Amazon’s $4.5bn, Hulu’s $2.5bn and Apple’s $1bn. There’s no denying that VoD is now well established as a part of consumers’ lives, and that tapping this market has become topmost priority for most content creators. However, from a supplier’s perspective, delivering content to multiple linear and streaming platforms is easier said than done, as it involves catering to myriad technical and localization requirements. With multiple formats, versions and vendors in play, smart thinking is needed to manage sprawling supply chains. Wherever possible, operational efficiencies need to be enhanced through standardization and consolidation. At the same time, Media & Entertainment (M&E) enterprises need to retain the flexibility to alter business processes based on ever-changing market dynamics. They need a powerful technology stack that helps overcome challenges like slow turnaround time, lack of agility, siloed operations, low levels of automation and the lack of visibility to assess the real time status of business processes. How can templatization help solve these problems? Today, there exist specialized Media ERP solutions that help M&E companies automate the content supply chain and build a connected enterprise. Such solutions enable users to quickly create, manage and modify business operation templates. Organizations can create a blueprint of their operations and manage/modify template versions as needed, while retaining the flexibility to customize the blueprint for different use cases. As a single system to orchestrate workflows, tasks and resources; a Media ERP solution presents limitless possibilities for enhancing efficiencies and driving creative enablement. The diagram below depicts how these templates can help M&E players design a modern, future proof, efficient content supply chain. A robust Media ERP solution provides features to configure custom data model templates, and also supports industry standard metadata models such as EIDR and Dublin Core. These industry standard data models can be easily plugged into data model design. This lays a strong foundation for a smart MAM, and can be further leveraged for efficient workflow and work order management. Right from acquisition to exhibition, each business process has its own underlying unique workflow which is typically a combination of machine enabled tasks (such as transcoding, technical check on ingest etc.) and human led tasks (manual QC, subtitling etc.). The execution of these tasks often require integration with 3rd party systems, interspersed with manual hand-offs. These complexities make it difficult for organizations to define, manage and monitor an end-to-end workflow seamlessly. A cloud-based Media ERP solution addresses this challenge through a BPM engine, and a workflow design workbench to define and design different versions workflow templates (across both machine and manual tasks). It supports versioning of workflow templates, and activation of the required version as per business requirements. The solution’s powerful and easy to use workflow designer comes pre-integrated with leading 3rd party industry systems and software, such as rights management, broadcast management systems, transcoding, edit systems, auto QC, file transfer, LTO archiving and hierarchal storage management. These ready integrations drastically reduce the time taken to design and roll out a workflow template. Business rules can be configured during workflow design to execute dynamic workflows and meet SLA requirements efficiently through features like smart alerts. For most content operations, machine enabled and human led tasks are carried out either sequentially or in parallel. A Media ERP solution provides powerful and robust work order management capabilities. This enables broadcasters, studios and service providers to manage machine and human tasks seamlessly by providing real time visibility through process dashboards, thus automating the content supply chain. Tied to underlying workflow templates, the solution’s work order management functionality can automatically create tasks, and empower users with the ability to assign these to internal or external resources across the supply chain. For instance, when a work order for content acquisition is triggered, corresponding tasks are created for operations like ingest, QC and subtitling. These tasks can be assigned automatically or manually to best-fit employees/external vendors. Ideally, a Media ERP solution should also facilitate optimal task assignment through an underlying algorithm which evaluates resources on parameters like skill, rating, availability and cost. Additionally, to cater to business process variations across the content supply chain, work order management templates can be metadata-driven. For instance, in a content acquisition scenario, a step like QC can be skipped or carried out, depending on the source of content. Similarly, a subtitling task for a particular language pair can be directly routed to a pre-selected vendor. This means that users no longer have to use multiple systems, emails, spreadsheets and calls for program management. They can enjoy streamlined operations with complete real time visibility of all business processes taking place across the supply chain. In M&E enterprises, access to content typically needs to be restricted department-wise, according to each team’s scope of work. For instance, the cataloguing team needs to have access only to cataloguing applications, the compliance team needs to have access only to compliance review tools, and so on. 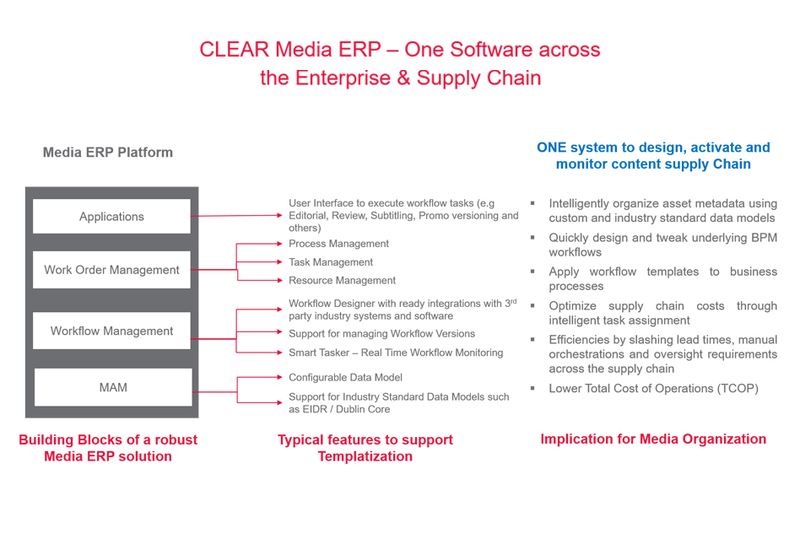 Leveraging the Media ERP software’s robust administration module, businesses can define access and permission templates for both content and tasks, based on their organization’s unique structure. The ability to manage business templates and orchestrate end-to-end supply chain processes using a single system can help broadcasters, studios and service providers unlock operational efficiencies and gain agility. Solutions like Media ERP help reimagine business processes, introduce greater levels of automation and reduce the need for manual intervention across the content supply chain. If powered by native hybrid cloud architecture, such solutions drive down the Total Cost of Operation (TCOP) drastically, by eliminating the need to invest in separate MAMs for each location, and bringing together assets, tasks, resources and 3rd party tools on a single platform. This is the key to drive lean operations in today’s complex media universe, where the surge in VoD is disrupting traditional business models and increasing pressures on content creators like never before.